Mixed with activator 4 to 1 ratio. 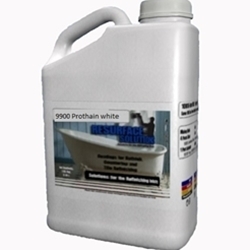 The 9900 Pro-Thane Reduced Odor is our finest bathtub refinishing coating offering. It delivers outstanding performance: durability, color and gloss retention characteristics to give you coatings that look good and work hard, through many years of exposure. Resurface Solutions coatings range gives you solutions for all kinds of applications while delivering exceptional value in bathtub refinishing supplies. Needs 109 Catalyst. See below in Related Items.